The disappearance of a Hollywood red-carpet movie star in mid-July, 2018. The call for the enforcement of employment and travel bans for court-ordered individuals. The rejection of the establishment of an independent judiciary. The man responsible for these decisions? The Chinese Chief Justice of the Supreme Court, Zhou Qiang. The aforementioned practices are emblematic of the evolving state of Chinese domestic affairs. They follow the trends of the consolidation of governing authority and control in the Middle Kingdom that first made headlines when the Chinese Parliament, under pressure from both Communist Party elites and the President and Party Secretary General Xi Jinping, abolished the term limits for the position of President on March 11, 2018. Let us first look at Zhou Qiang and how he, as Chief Justice of the Chinese Supreme Court, arrived at the decisions that were made. In regards to the case of the Chinese actress Fan Bingbing, the subtle lack of publicity, especially coupled with the mysterious manner in which the case was handled, is worth noting. Fan Bingbing, star of countless Chinese box office hits and several Hollywood productions such as installments in the “X-Men” and “Iron Man” series, disappeared for three months between July and October of 2018. She later reappeared in public shrouded by allegations of massive tax evasion, estimated at $129 million USD in back taxes, levied against her by the Chinese government. The dramatics of this situation, most notably her sudden and prolonged absence from the public eye and social media (of which she is an avid user), suggest a desire by the Chinese government to convey to the public its seriousness in dealing with such matters of government importance and to reinforce its international political legitimacy and prowess. The next item under scrutiny is the call for the strengthening of employment and travel bans for individuals with low credit who have failed to pay court-orders or have engaged in “suspicious financial activity”. While this decision does not have a significant global impact, the impact of these measures on Chinese society is something that cannot be understated. As Bloomberg News reported based on statistics issued by China’s Supreme People’s Court at the end of 2018, individuals falling under the above criterium had been stopped from taking “17 million flights, 5 million train trips, and blocked from acting as executives or legal business representatives 290,000 times”. Here again, the Chinese Supreme Court under Chief Justice Qiang is exerting an increasing amount of control and authority over the everyday lives of millions of Chinese. Finally, let us analyze Chief Justice Zhou Qiang’s denouncement and outright rejection of the formation of an independent judiciary system. Initial analysis of this may seem counterintuitive. In order to achieve greater control of society and the ability to implement more intensive societal reforms, greater independence for the Chinese judiciary would seem optimal in removing possible hamstrings it may face from the political bureaucracy. Yet, behind this face-value rejection of postulated judicial independence is yet another hidden consolidation of power. Only this time it is not done on behalf of the Supreme Court, but on behalf of President Xi Jinping, the Chinese Communist Party, and the Chinese Government. 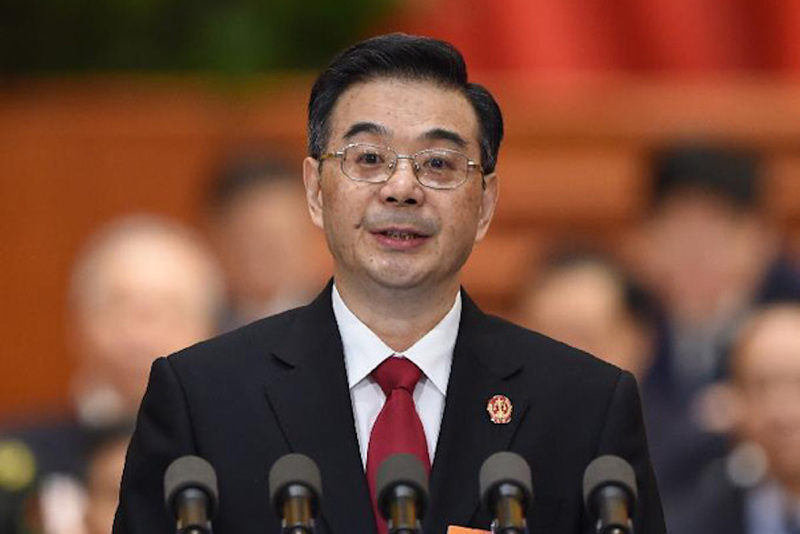 It is important to remember that while he is the Chief Justice of the Chinese Supreme Court, Zhou Qiang is moreover a senior member of the Chinese Communist Party, having previously served most prominently as the Communist Youth League’s first secretary. And in a state where it is now possible to retain the Presidency for life and government censorship is rampant, such direct government involvement is not at all surprising. Recognizing these trends of consolidation and control within Chinese society is critical to maintaining an effective and accurate working definition of what the Chinese state is and where it is going. It is the pinnacle of the modern authoritarian nation-state decades in the making, constantly evolving and refining its blend of authoritarian rule with Western elements in a way the world has never seen. We must continue, therefore, to make a concerted effort to observe and understand the changing dynamics of the Chinese government in order to best prepare ourselves to effectively engage with it in the future.